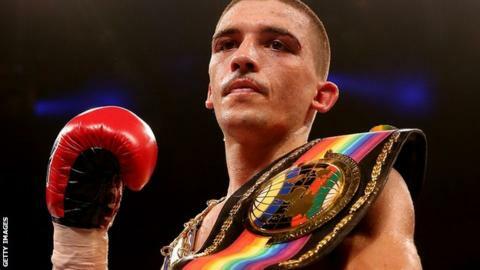 Welsh featherweight Lee Selby will face Romulu Koasicha in an official eliminator for the World Boxing Council version of the title on 17 May. The 27-year-old, currently number three in the WBC rankings, secured the European featherweight title in February with victory over England's Rendall Munroe in Cardiff. Champion Jhonny Gonzalez defends his title against Clive Atwell on 24 May. "Lee is buzzing right now," said promoter Eddie Hearn. "He put in a great performance against Munroe in a sold out arena in Cardiff and he can't wait to get back there. "He is nicely poised in the rankings and the plan is to be the mandatory challenger by the close of the year." Gonzalez fights Guyana's Atwell in his native Mexico a week after Selby's fight against Koasicha, also from Mexico, at Cardiff's Motorpoint Arena. British and Commonwealth champion Selby's fight will be on the same bill as Nathan Cleverly's comeback to the ring. Cleverly, 27, has not fought since losing his WBO light-heavyweight title in a fourth-round stoppage to Russian Sergey Kovalev in August 2013.